Jesus: The Evidence is a booklet. Jesus: The Evidence is a one evening presentation. Jesus: The Evidence is this website. Today's historians (including the majority of non-Christian historians) specialising in 1st Century, Middle-Eastern history nearly all agree that a teacher and holy man called Jesus lived in 1st Century Palestine, collected a band of followers and was executed under the order of the Roman prefect of Judaea, Pontius Pilate in Jerusalem around AD33 (most likely 3rd April 0033). 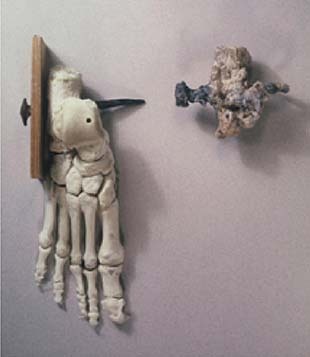 Foot bone of crucification victim found in Jewish tomb in Jerusalem (right) - with recunstruction to the left. We have clear evidence that within a few years of this (AD 40 to 50), communities of Christians had become established throughout the eastern half of the Roman Empire – despite hostility and persecution from the Roman authorities and the non-Christians they lived amongst. Historians can tell us that all types of persons became Christ–followers. This wasn’t a faith restricted to one ethnic group or social class. Jews, Greeks, Romans, Syrians, Ethiopians, Egyptians, the rich, the poor, men, women, slaves and the free became Christ-followers at this time. We have clear evidence that by AD64, there was a Christian community in Rome that was large enough to come to the attention of the emperor Nero and be blamed for the great fire of Rome. What did these first Christians believe about Jesus? We have good evidence that these Christians believed that Jesus was the Son of God and that He’d died and appeared to His disciples three days later (also known as the Resurrection). They also believed that He’d died as a sacrifice for their sins. Christian beliefs developed and modified in the centuries following Jesus. However, belief in the Resurrection of Jesus and what it meant has remained a constant – a constant that can be traced with certainty to within a few years of Jesus death. 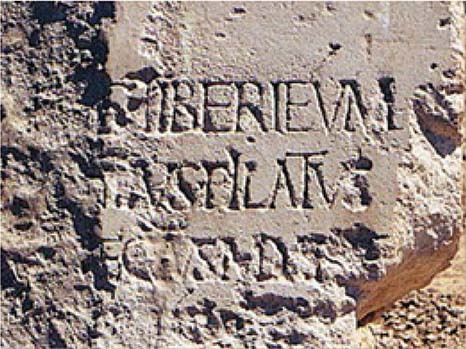 An image of Roman graffiti mocking Christian worship found on a wall in Rome. 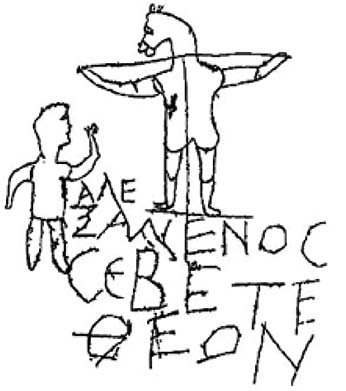 It reads (in Greek): "Alexamenos worships [his] God" Date is 1st to 3rd century. 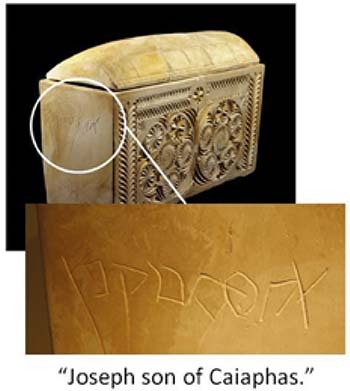 Ossuary with the name ‘Caiaphas’ inscribed on the side. This may be the same Caiaphas who interrogated Jesus in the Gospels. Historians know that “something happened” in Jesusalem around AD30 to 33 to convince Jesus’ disciples that He was the Son of God. This “something” caused the birth of Christianity and caused it to spread like wildfire through the Eastern Roman Empire. This “something” caused all types of people to become Christ-followers - despite extreme hostility and persecution from those they lived amongst. This “something” caused Christianity to grow - despite almost continual persecution for the first 300 years of its existence. Jesus: The Evidence examines the wealth of evidence we have for what happened nearly 2,000 years ago.